A region full of history and rich in food and wine experiences is the perfect enticement for the discerning traveller. Leif Carlsson, Lutz Hugel, Gianni Villa, and courtesy of Domaine Weinbach, Domaine Zind-Humbrecht, and Meyer-fonné. How do you feel about gingerbread houses? I ask because it will affect your view of Alsace. Not all of Alsace is made of gingerbread houses, because this is a disputed border region where armies have ebbed and flowed – and nothing is worse for gingerbread houses than armies ebbing and flowing. But there are still gingerbread-heavy towns such as Riquewihr, for example, or Colmar. And they are remarkably pretty. The conventional picture, then, of Alsace is of steeply roofed, half-timbered houses adorned with overflowing window boxes of pink, red and white geraniums and petunias. There will be a Gothic church with a spire, cobbled streets climbing up to where the houses end and the vineyards begin on the dry, sunny east- to south-facing foothills of the Vosges mountains, and vines reaching up to the forest at the hilltops – the rows going every which way according to the decisions of many different owners. There is a feeling of plentifulness: the food in the restaurants is rich and sustaining and rounded off with eau de vie made from plums, raspberries, or cherries. There is choucroute, which is German sauerkraut made with French skill; there is divine tarte flambée topped with crème fraîche, onions, cheese and bacon; there is baeckeoffe, a casserole of pork, beef and lamb (yes, “and” not “or”) with a potato topping; there is foie gras; there is freshwater fish, onion tart, and fruit tarts for dessert. Then there is powerful Munster cheese, produced since the 14th century by monks who arrived in Alsace from Ireland, and who naturally called their monastery and their cheese after their native province. The food is wonderful, but it is not light. All the more reason then to follow those cobbled streets up the hill and into the vineyards. The hills are where the Grands Crus are to be found, those 51 vineyards controversially given the distinction after the inevitable wrangling. The problems revolved around the delimitation of each vineyard – Johnny Hugel, of the eponymous grower, had been instrumental in driving forward the Grand Cru scheme and then, with a geologist, in analysing and identifying the best sites. But then local politics took over and the final boundaries were a fudge, being drawn far more generously than they should have been. Now Jean-Frédéric, Johnny’s great nephew, suggests ideally there would have been just 20 Grands Crus, backed up by the creation of a layer of Premiers Crus for the 31 “almost-good-enoughs”. But we are where we are. Hugel, after a long period of boycott, has come round to the idea of putting the words “Grand Cru” on its labels and so has Trimbach, another original refusenik. Only Léon Beyer still takes a purist view and refuses to use the designation. For everyone else – well, it’s not a perfect system, but it’s done more good to Alsace. Quality in the Grands Crus has risen along with ambition: there has been something of a race to the top, led by growers of imagination and intellect. If only people would drink more of the wines, Alsace would be in a good place. Time for a quick burst of history. Why should a region with such advantages of geology and climate have ever had problems? History and geography were the causes. If you go back to 1870 and the Franco-Prussian War, you have a picture of French defeat and an Alsace taken by Germany as part of the spoils of victory. Germany fostered the production of beer and tobacco in the north of Alsace, and wine in the warmer south. So, insofar as the north produced wine, it wasn’t their main crop, and quality tended to be lower from larger yields and sold to négociants rather than bottled under their own names. Being further away from the urban centres of Strasbourg and Colmar also didn’t help. Valérie Bott-Cartier and Jean-Christophe Bott of Bott-Geyl. In the south, by contrast, the growers were more dedicated to their own terroirs, making riper, more concentrated wines and building their own reputations. This is where the top producers were found. Alsace, after World War I, returned to France. And, after World War II, it was poor and labour tended to head to the textile factories rather than to the land. As in most places in Europe, recovery took the form of producing as much wine as possible rather than the best wine possible. And, as in most places, that only really changed in the third quarter of the 20th century. Some say there is still a Catholic-Protestant fault line in vinous Alsace. The first Grands Crus were introduced here in 1975. And, imperfect though they are, they do throw the focus back on to geology. There’s an awful lot of geology in Alsace – rather more than any one region needs, you might say. It’s on par with the Côte d’Or for complication. As you stride up the hill after lunch, telling yourself you’re walking off the tarte flambée, take a look at the old vineyard roads. Nearly all of them follow geological fault lines. Some faults run south-west to north-east, others transverse faults across them. Soil can be based on Vosges mountain rock (basically volcanic, slate, sandstone or granite), on marine sedimentary soils (limestone or marl), on windblown soils like loess or, on the plain, alluvial soils. Exposures vary constantly and wind and shadow add their influences. 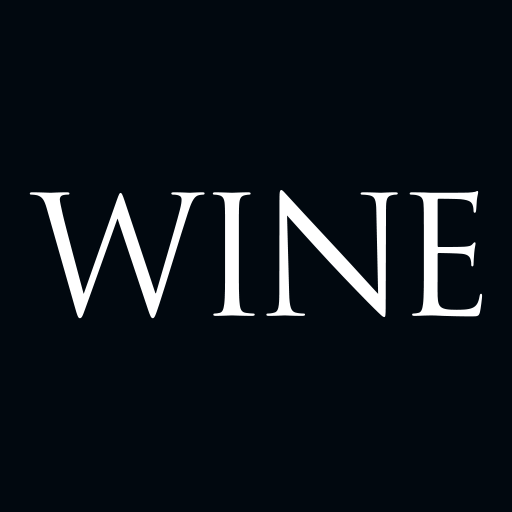 All – if you’re a grower focused on expressing your terroir – mean a different character in your wine. Overall, there’s a common style to Alsace wine: an opulence, a spicy weight. That applies to all the white grapes grown here including riesling, pinot gris, pinot blanc, gewürztraminer, sylvaner and muscat. It doesn’t apply to the sole red grape, pinot noir, which is at last benefiting from warmer summers and acquiring some decent concentration and ripeness. One of these years it will even be eligible for “Grand Cru” status, when the bureaucrats get round to it. 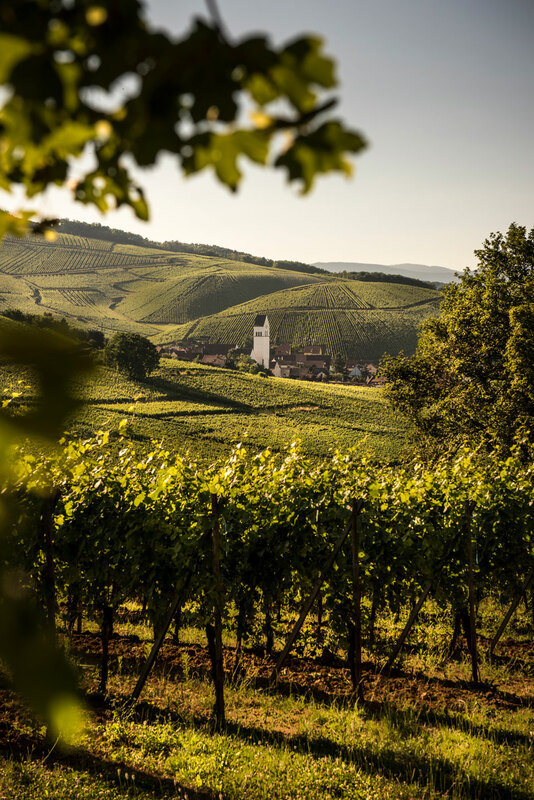 At the moment, the only grapes that can be grown for Grand Cru wines are riesling, pinot gris, gewürztraminer and muscat, plus sylvaner in the Zotzenberg Grand Cru and blends in Altenberg de Bergheim and Kaefferkopf. All the white grapes also make sweet wine – late-harvest Vendange Tardive or even sweeter, botrytised Sélection de Grains Nobles (SGN) – that really play up the lushness and opulence. But how opulent should Alsace be, actually? Properly sweet wines, labelled as such – yes, sure. With your tarte au quetsch or your foie gras, or even your Munster, there’s nothing more luxurious than a Vendange Tardive or an SGN. But when you buy a wine you expect to be dry and it turns out to be sweet, it’s annoying. It has been a problem. Growers were pushing for maximum ripeness and maximum concentration to see how far they could go. Too many wines ended up sweet, or at least semi-sweet, and drinkers were confused and ultimately deterred. You might want a gewürztraminer to go with, say, a curry, but you probably don’t want to discover, too late, that it’s sweet. But now the wines are drying out again. Even Zind-Humbrecht – brilliant, focused and the leader of the “push-the-envelope” growers – is making much drier wines. It’s a relief. And it puts Alsace exactly where it should be: making wines with a tense, and concentrated vinosity that goes perfectly with food of a certain richness. Grand Cru Schlossberg at Domaine Weinbach. The Grands Crus are the epitome of this style: volcanic Rangen de Thann for a smoky, flinty note, windy Geisberg for acidity and tension, and iron-rich Hengst for power and richness. For everyday drinking there are lighter, simpler, fruity wines, grown on the plain, and at the lower end of the price scale, which focus on grape variety rather than terroir. Having divided the wines into sweet and dry, Grands Crus and others, there is still one other fault line to consider – and it affects the style of what you’re drinking. Some say there is still a Catholic-Protestant fault line in vinous Alsace, and that it reveals itself in wines: of baroque richness and openness, more malolactic fermentation and lees ageing (Catholic) or of austere tightness, more restraint and more reductive winemaking (Protestant). However, some go further and say that there are villages that are Catholic and others Protestant – these physical divisions date back to the violence and destruction of the Thirty Years’ War (1618-48) which wreaked such havoc in central Europe. 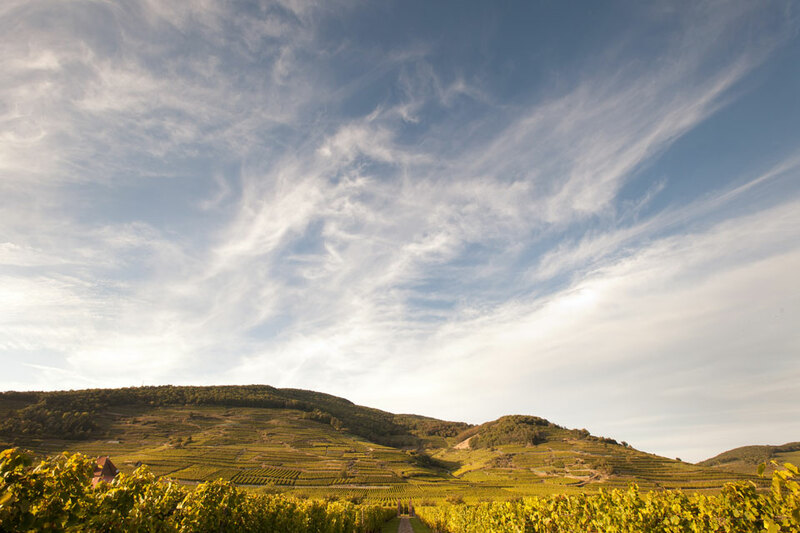 Others say, yes, but the terroir of a largely Protestant Riquewihr, for example, gives tight wines by its nature, and that the south of the region – which gives richer wines anyway – happens to be mostly Catholic. Well, it’s a good conversation to have over dinner. These days growers would prefer you to focus on their terroir. And the terroir, after all, was there first. Domaine Weinbach (domaineweinbach.com) is near Colmar, a good-sized town which is gingerbread central as far as architecture is concerned. The Domaine is a family operation based in a red Vosges-sandstone house beside a stream, with hills all around. Théo Faller makes the wines, and his mother Catherine does everything else. The vineyards are farmed biodynamically, and the wines have structure balanced with filigree texture, great minerality and elegance. As always, there are umpteen different cuvées to choose from. Luckily everything is brilliant. Trimbach’s Clos St Hune, from the Grand Cru Rosacker vineyard, is hard to better, even in a region of great rieslings. Tight, austere, and maturing after 10 or 15 years to enormous complexity, it’s one of the high points of Alsace. The Trimbach (trimbach.fr) style is dry, tight and linear. The family is welcoming and based in Ribeauvillé, which should be on your itinerary. There are three ruined castles on the hills above, and the town centre is filled with pink-, yellow- and blue-washed houses built from the middle ages onwards. Vendange Tardive is a speciality at Hugel (hugel.com), though sweet wines are only about 2% of its production. Look also for splendid newish dry Schoelhammer, from a nugget of vines at the heart of the Schoenenbourg Grand Cru. 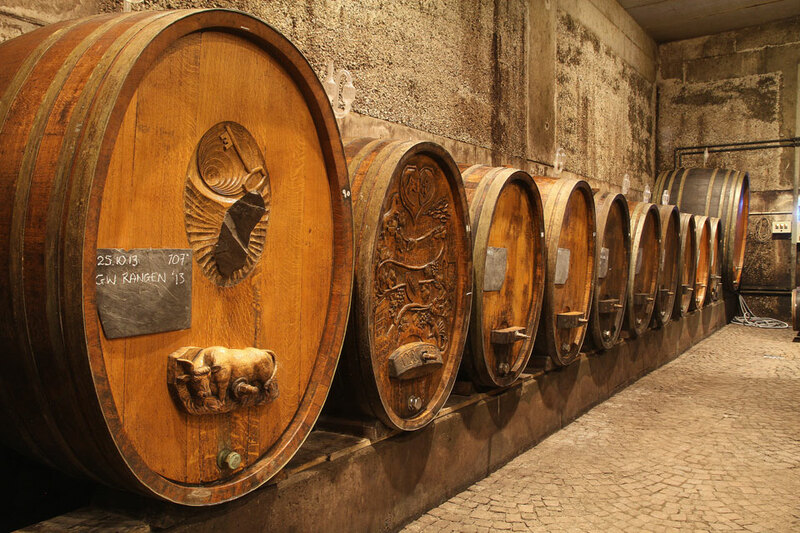 The Hugel style is for tightness, structure and long life – and dryness, except (obviously) for the sweet wines. It’s based in Riquewihr, and patriarch André, Johnny’s brother, is a passionate local historian. Olivier Humbrecht from Domaine Zind-Humbrecht. Domaine Marcel Deiss (marceldeiss.com) produces distinctive, biodynamic co-fermented field blends. The wines are very winey and complex, and though they are not always immediately accessible, they make you sit up and take notice. 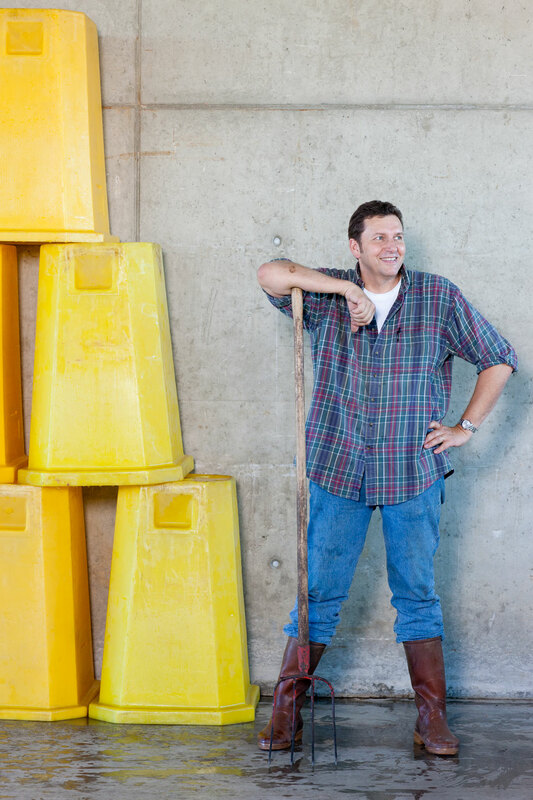 Winemaker and manager Jean-Michel Deiss is not the easiest of characters, but he’s doing things no one else is. His old co-planted Schoenenbourg vines were the trigger, and now he’s replanted all his top sites as field blends. He also announced seven of them were “Premiers Crus”, which must have come as news to the authorities who don’t recognise any such designation in Alsace. Léon Beyer (leonbeyer.fr) stuck to making dry wines when all those around him were getting sweeter and sweeter, and now the mainstream has come back to join him. The Grand Cru is the tense, concentrated Riesling Comtes d’Eguisheim. 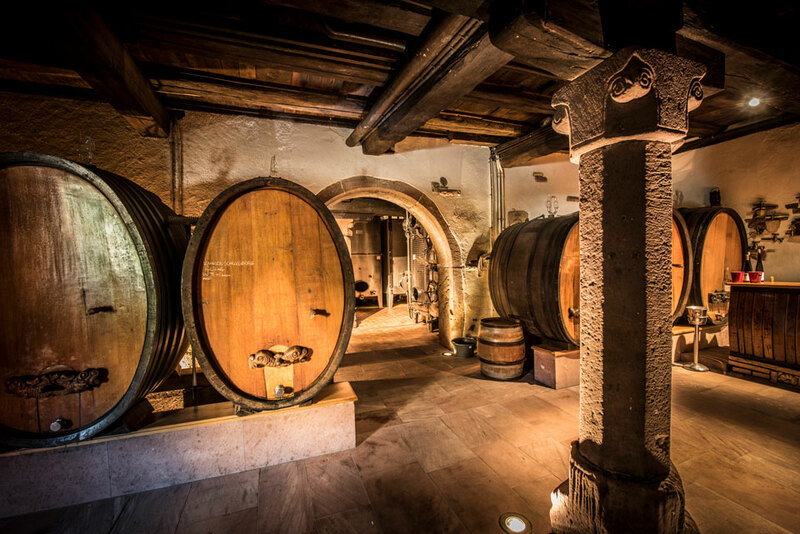 Fermentation at relatively high temperatures – and often in old oak foudres – gives the wines a distinctive style. If you want to drink a local red in Alsace, Beyer’s Pinot Noir should be your first choice. Jean-Christophe Bott at Bott-Geyl (bott-geyl.com) is a newer star, making a name for himself with wines of depth and precision from biodynamic vineyards, indigenous yeasts and low-intervention winemaking. I adore his precise, dark-fruited Riesling Schoenenbourg. With an enormous finish, it’s a wine destined for a long life. His inspiration in searching for terroir expression was Zind-Humbrecht, and he could hardly have had a better source of advice. 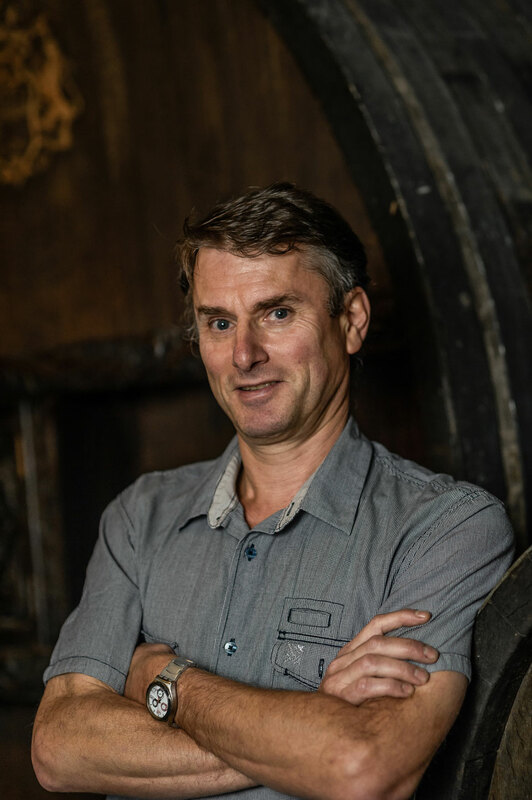 Olivier Humbrecht of Domaine Zind-Humbrecht (zindhumbrecht.fr) is greatly admired by other local winemakers because of the depth and detail of his research and his generosity in sharing it, as well for his great winemaking skill and knowledge. His biodynamic wines went through a long period of enormous richness but are now getting drier, and easier to match with food. They’re notable for their complexity, elegance and detail: Clos Saint Urbain Grand Cru Rangen is one of the greatest wines in Alsace. 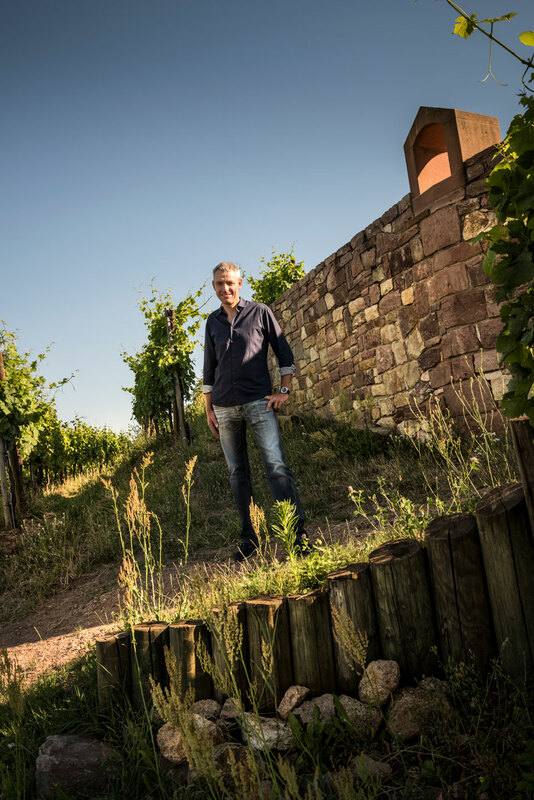 Third-generation winemaker Félix Meyer at Meyer-Fonné (meyer-fonne.com) makes dazzling wines of nerviness and tension from the granite soils in his home village of Katzenthal. The vineyards are basically organic. His Riesling Wineck-Schlossberg is a wine of crystalline delicacy and powerful energy. The Schlumberger family (domaines-schlumberger.com) started out in textiles and bought vineyards in Guebwiller in the 19th century. It is there, in the warm south of Alsace, they make wines of weight and richness, balanced with raciness and definition. 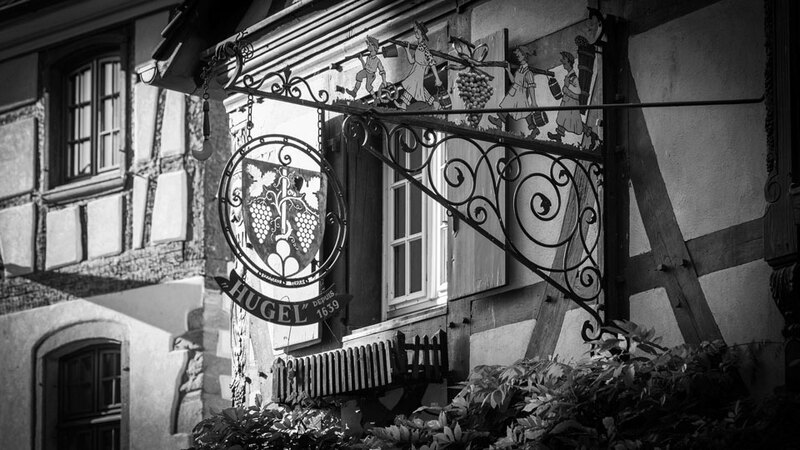 It’s now Alsace’s largest estate, nearly half of it organic and some of it biodynamic. Look out for their gewürztraminer. The Caves Coopératives of Alsace are famous for their high quality. They’re never the most glamorous places to visit, because they’re built for function rather than beauty, but wines from the Caves Coopératives at Ribeauvillé (vins-ribeauville.com), Turckheim (cave-turckheim.com) and Beblenheim (cave-beblenheim.com) are definitely worth buying. Michelin-starred Au Pont du Corbeau (+33 3 88 35 60 68) is said to be the best winstub (brasserie) in Strasbourg – it’s always crammed, and doesn’t take reservations. Traditional Alsatian food of very high quality, but with an informal atmosphere. Chez Yvonne (restaurant-chez-yvonne.net) is another Strasbourg winstub serving local dishes like goose liver, pork knuckle and, remarkably, onion tart “with cartoons” (“cardoons”, rather than Tom and Jerry). The wine list is short but excellent. If you’ve had enough of traditional red-and-white gingham tablecloths, try hotel-restaurant Les Haras (les-haras-brasserie.com). The building used to be a stud farm and riding school, and it has high ceilings and contemporary interiors in an 18th-century building. The wine list is stuffed with good names, and in the brasserie you can eat such delights as pork belly cooked for 48 hours. I once looked out of my window at Le Colombier, Colmar (hotel-le-colombier.fr) and saw a perfect rainbow spanning the horizon. I can’t promise you that, but this is a very comfortable base in the centre of the town, within walking distance of everything you’ll want to see. Colmar is itself a good base for exploring the region: it’s bang in the middle of the best stretch of vineyards, it’s famous for its canals, and you can overdose on Gothic architecture in the town before tucking in to some kugelhopf for a well-earned dessert. ‍L’Atelier du Peintre in Colmar (atelier-peintre.fr) serves top-class contemporary French cooking: tomato cooked several different ways, and fillet of Salers beef with “textures of beetroot”. Maison Rouge (restaurant-maisonrouge.com) specialises in traditional dishes but with some surprises. Choucroute aux poissons, for example, or superb Galician beef. The wine list is good value, with such affordable bottles as Riesling Grand Cru Brand from the Caves Coopérative de Turckheim for €44 (A$68). The three Michelin-starred L’Auberge de l’Ill (auberge-de-l-ill.com) is Alsace’s trophy restaurant – the one everyone wants to go to and for which you will have to book far ahead. You can stay here as well (in the Hotel des Berges). Salmon soufflé is a restaurant speciality, as is mousseline of frogs’ legs, or you can have zucchini with glazed eel, local venison or wild duck. La Table du Gourmet (jlbrendel.com) in Riquewihr is a delight: faultless food, beautifully presented. It has one Michelin star and a top-class wine list. Flavours are fresh and modern with plenty of vegetables (not a given in France) and you can order four or five different glasses of wine to go with each menu, which is a very good way of exploring an alluring list. In beautiful Kaysersberg, try to stay and eat at Le Chambard (lechambard.fr). The hotel is luxurious, the restaurant has two Michelin stars (there are plenty of stars scattered round Alsace, as you’ll have gathered), and there’s a cheaper, simpler but still excellent brasserie as well. Top prices, extremely refined cooking. Or you could just eat at Le Chambard and stay at the simpler, but comfortable and attractive, Hôtel les Remparts (lesremparts.com) in Kaysersberg. What you save might even pay for dinner. Obernai is less well known than some Alsace towns but it’s worth seeing, and La Fourchette des Ducs (lafourchettedesducs.com) has a brace of Michelin stars, different art nouveau dining rooms for winter and summer, and beautifully light and inventive cooking. Milk-fed lamb from the Pyrenees or Breton lobster, anyone? While you’re in Obernai, stay overnight at A la Cour d’Alsace (cour-alsace.com). It’s comfortable, with a spa, a very good restaurant and a winstub. The latter has updated traditional food, the former such delights as Alsace beef fillet with porcini mushrooms or wild sea bass with truffle. Vines at Meyer-Fonné overlooking the village of Katzenthal.